Born 2 Impress Pampered Mom Event- Organizeit Review and Giveaway. Do you remember the Everything Home event we had on the blog just a few months ago? 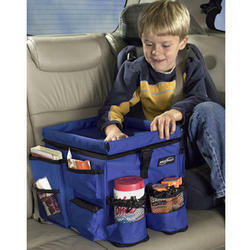 If so, you will probably remember the review for the Kids BACK Seat Organizer I did for Organizeit . The Back Seat Organizer was a great solution to keep everything I need in the car for the ladybug and keep it organized and handy at all times. The organizer features a flip-top lid which converts into a sturdy tray for a playing surface, great for coloring books, with identical sides with 4 pockets each hold games, CD players, books, snacks and drinks. The adjustable dividers inside keeps everything organized, fastens securely with seatbelt and releases quickly when you’re on the go. The carry strap provides hands-free portability. This is truly a must have for parents on the go and one of those products I am really glad I found! Organizeit specializes in all kinds of organizational products for the different areas of your household. Since I really believe that organizing the house is a great way to pamper mom (at least in my case), I am very happy to bring you another great product from this company. On this occasion I had the chance to review the 3 Shelf Corner Caddy. 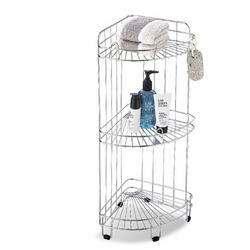 This 3-tier shower caddy is designed to fit in the corner of the shower, which I must add I love not only because it allows me to store and organize all my shower essentials and then some, but because it takes no space at all and you can move it from one corner to the next if you decide to. The shower caddy is made of rust resistant stainless steel, and measures about 11.5″ X 9″ X 24″H, just the perfect size and it gives me a lot of storage space that is so much needed in the shower. Now I can store all of the hair products, soaps, razor, shaving cream, toothbrush and toothpaste all in one well organized space. The caddy has rubber stoppers on each stand to prevent it from scratching the floors and keep it in place. The caddy retails for 44.99. Orfanizeit has kindly offered one lucky Born 2 Impress reader, the chance to win a free 50.00 gift certificate to their online store. To enter this giveaway, please like Organizeit on Facebook( Please let me know your Facebook name) and then head over to their site and tell me what will you buy if you win this giveaway. This is mandatory to participate. (You MUST be a public follower of the Born 2 Impress blog enter this giveaway, and if your profile is set at private, entries don’t qualify). 2 entries Grab the Pampered Mom Event button located on the right hand side bar. 2 entries- Grab the Born 2 Impress button. 2 entries- Follow me on Twitter and Tweet about this free giveaway using:Get organized with @born2impress #win a 50.00 Gift Certificate to Organizeit.com. http://bit.ly/g7Hq8XUp to once a day! 2 entries- Become a friend on Facebook and post the giveaway on your wall- Link is on the right hand side bar. This can be done daily. 2 entries- subscribe to my feeds. 5 entries – Blog about this free giveaway and post the link here. Make sure to leave a message for each entry. 2 entries- Enter my other giveaways and post 2 comments for each one you entered. Giveaway ends May 22nd midnight. Eastern Time. Contest open to U.S . residents with a valid street address. No PO Boxes please. Winner(s) are selected randomly through the use of random.org unless otherwise noted and will be announce on the contest closing date. To claim your prize(s), you must contact Born 2 Impress within 48 hours of the contest closing Prize(s) not claimed by (48 hours) will be forfeited and a new winner will be selected in a live giveaway. Please provide a valid email address to be informed in case you do win a giveaway. We have a winner: True Random Number Generator Min:1 Max: 849 Result: 184 Powered by RANDOM.ORG. Congratulations: Mrs.Smitty!Please contact me within the next 48 hours to claim your prize. « Born 2 Impress Pampered Mom Event- Hello Canvas Review and Giveaway. I love the folding sweater dryer. I follow via Facebook. Cortney S.
I would get the 4 Section Laundry Sorter. I entered the Kobo eReader giveaway. I entered the Deordio Designs giveaway. I entered the Hello Canvas giveaway. FB Fan! I would buy the Fruit Tree and a variety of the clip and close containers! i like the folding sweater dryer. this would be a perfect gift!!! connie danielson. i like them on fb. Like their FB page: Karen Bridges and I would choose the York Over the Door Towel Rack, and the Purseket. Follow on Facebook. I would get some storage containers for the kitchen, such as the Buddeez Bread Buddy Bread Dispenser. I like Organizeit on FB. I’d love to buy a few of their Extra Large Storage Totes. I have tons of ideas for those, including toy organization! I would love to get the Linus Bedroom Drawer Organizers! I like Organizeit on FB and I would use the gift card to purchase a garden rack with basket. fan of organizeit on facebook! 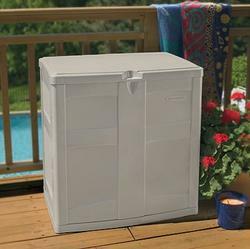 It looks like a great patio storage box! 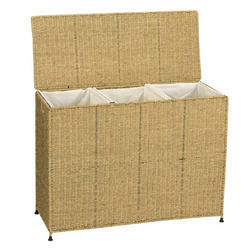 I like Organizeit on facebook as Allison L & would buy the small deck storage box if I won! I entered the Flip out Samdals giveaway. I would probably get the car back seat organizer. Thanks! I like Organize It on Facebook (Erika B) & I think I would get the FIFO Can & Food Storage Rack – this would be great for my pantry! I am already a public follower of yours. Thanks! I would like to get the 4 section laundry sorter! I entered the Chooka boots giveaway! I entered the Chooka boots giveaway entry 2! and I would get the small deck box. Cisco Valet Review and Giveaway. Kobo eReader Review and Giveaway. Teton Sports Review and Giveaway. UMI Shoes- review and Giveaway. Little Pink Tools Review and Giveaway. Overland Bags Review and Giveaway. Bloom Avenue Review and Giveaway. Curly Cue Review and Giveaway. Ablazed Candles Review and Giveaway. Navoh Handbags Review and Giveaway. I have entered your Sanuk Footwear Review and Giveaway. I would love to habe the Tripod Air Dryer. Also eneterd the psAna giveaway. Also eneterd the prAna giveaway. I liked Organizeit on FB: cyndi derouin stallinlgs, and I would buy a bunch of stuff for my car such as the carganizer and auto litter bag!! !